FARMINGTON -- The tractor-trailer driver who crashed his 18-wheeler into a YMCA minivan in August, killing a 12-year-old girl from Connecticut, will not face criminal charges, according to Franklin County Assistant District Attorney James Andrews. FARMINGTON — The tractor-trailer driver who crashed his 18-wheeler into a YMCA minivan in August, killing a 12-year-old girl from Connecticut, will not face criminal charges, according to Franklin County Assistant District Attorney James Andrews. Andrews announced the decision Monday not to pursue criminal charges after his office spent the last month reviewing a police investigation into the crash in Farmington on Aug. 17. The district attorney’s office had been considering bringing a vehicular manslaughter charge against Charles Willey, the 53-year-old Dexter man who was driving the tractor-trailer owned by Linkletter Trucking of Athens, Andrews said. “We will not be bringing any criminal charges, and as far as I know there haven’t been any civil tickets issued,” he said. 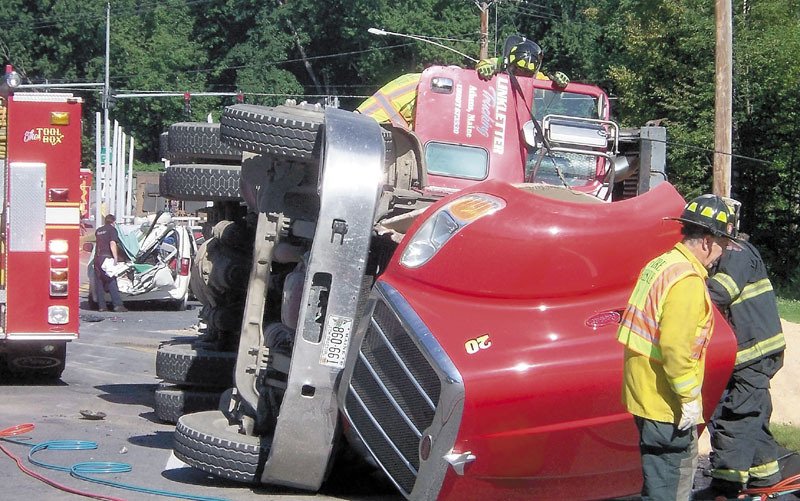 Excessive speed caused Willey to lose control of the tractor-trailer on a sharp, curving yield entrance to U.S. Route 2 in Farmington before the crash, Andrews said. The tractor-trailer veered across the center line and hit the minivan, which was stopped in traffic on the other side of the road. Tess Meisel, of Westport, Conn., was killed when the truck hit the minivan, crushing the rear row of seats where Meisel was sitting. The investigation found the tractor-trailer was going 11 mph over the speed limit, and that Willey did not have a criminal background, according to Andrews and police reports. The posted speed limit on the yield entrance is 30 mph, and there are other traffic rules tied to slowing down for the yield. Andrews said Monday that there was not enough evidence to prove Willey was criminally negligent in causing the crash. There was no other traffic violation or personal misconduct other than speed that contributed to the crash, he said. The tractor-trailer was going faster than the posted limit but not at a speed that is considered a gross deviation from the standard of a reasonable and prudent person, which is what the law requires for certain criminal charges, Andrews said. The law that separates criminal speeding charges from a civil violation typically requires a vehicle must be going at least 30 mph over the speed limit. Road conditions and other factors are also taken into account by the law, he said. “It depends on the circumstances,” he said of charges tied to speeding violations. State police conducted a reconstruction of the crash to determine the speed of the tractor-trailer just before it crushed the rear of the minivan. The tractor-trailer had just crossed Sandy River on Route 4 and turned right, heading south, onto U.S. Route 2 when it crossed the center line and hit the van. The tractor-trailer then tipped onto its side, spilling its load of sawdust. Andrews has been contacted by attorneys representing Meisel’s family and the trucking company from Athens about the investigation, he said, declining to give other details about possible civil litigation. “There is insufficient evidence to prove criminal negligence, which does not mean that there isn’t civil liability,” Andrews said. Two requests this week for comment about the investigation were not been returned by the trucking company. There have been no civil lawsuits filed in connection with Meisel’s death, according to a spokeswoman at the Franklin County Superior Court in Farmington. Meisel’s mother, Suzanne Tanner, did not return a request this week for comment on the investigation. The minivan was owned by YMCA Camp Jewell in Colebrook, Conn., and was traveling from Acadia National Park to a park in Vermont. Two other girls from Connecticut were injured in the crash. The injured girls were Samantha Hollander, 15, and Samantha Galvao, 13. Galvao, of Westport, was treated at the hospital and released the day of the crash. Hollander, of Wilton, Conn., was taken by ambulance to Maine Medical Center in Portland, where she was treated and released the same day. The driver of the minivan, Charles Powell, 23, of Colebrook, Conn., was taken to the hospital but did not receive medical treatment. Willey was taken to the hospital, treated and released the day of the crash.